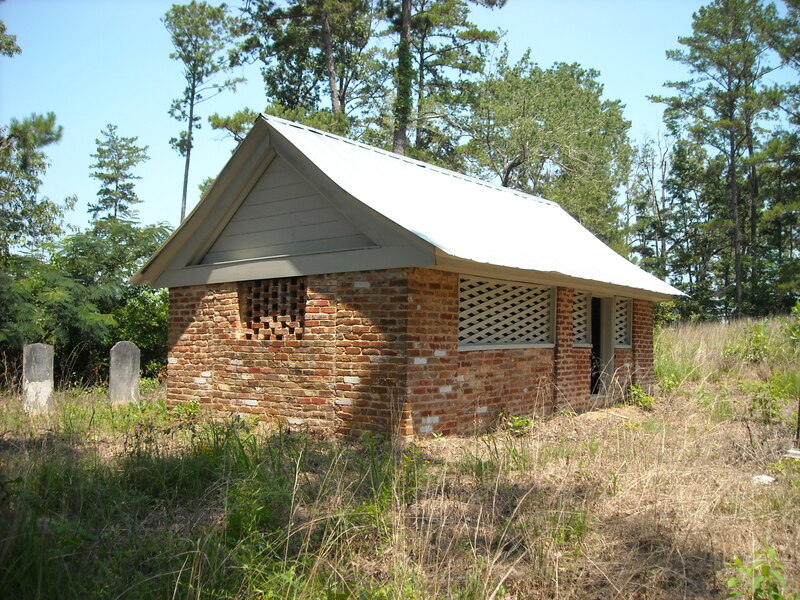 On the National Register of Historic Places, it is a rare example of a grave shelter in Ala.
Intersection of Jackson & Cobb Streets in Grove Hill. Built in 1854 by Dr. Lemuel Lovett Alston. 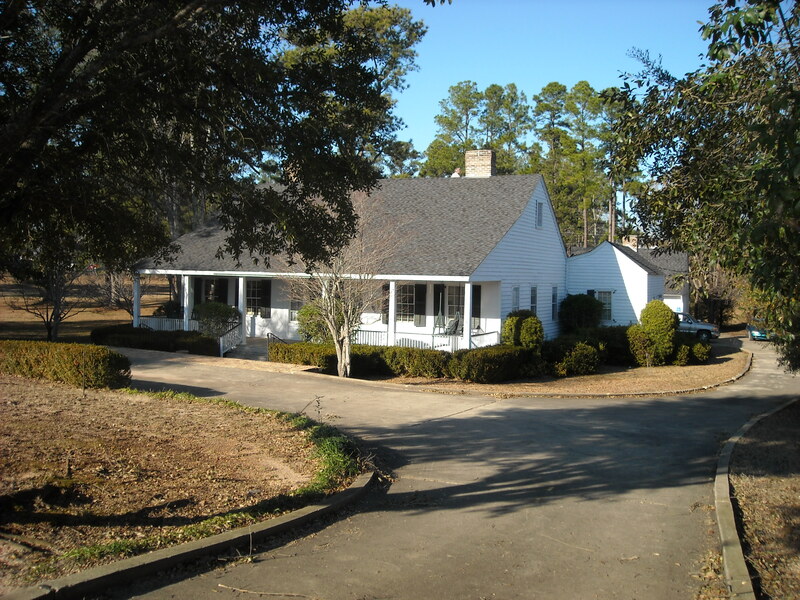 Greek Revival I-house, also called Plantation Plain. One of only four I-houses to survive intact in the county. Subsequently owned by the Bettis, Cobb, Bumpers, and Postma families until it was purchased by the Clarke County Historical Society in 1980. It is on the National Register of Historic Places & open to the public. Off of Co. Rd. 15. Head south past Central Salt Works marker. Take next dirt road to the right (Lady’s Landing Road). Marker will be on right. 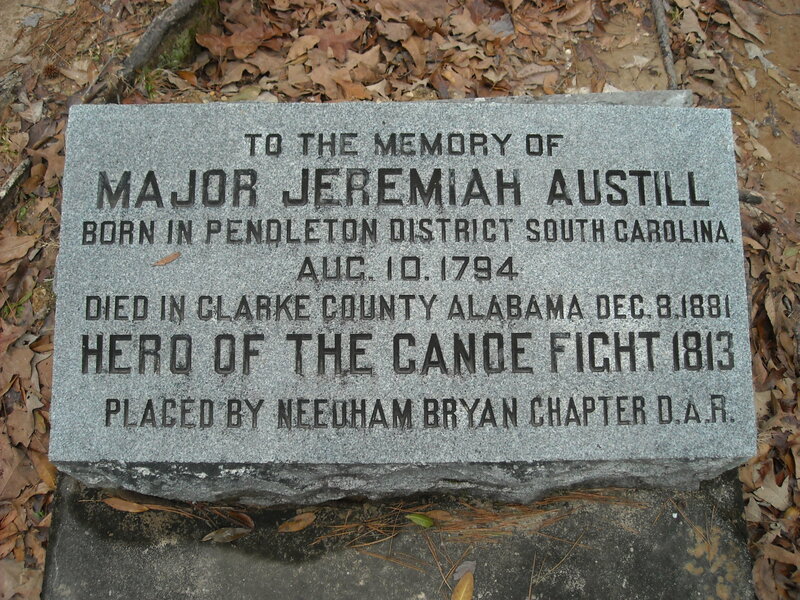 Jeremiah Austill is known as the Paul Revere of Clarke County. As a teenager, he volunteered to make a dangerous night ride to Mt. Vernon following the Creek War attack on Ft. Sinquefield. He was also a hero of the famed Canoe Fight on the Alabama River. Read more in our Museum Store. Rev. 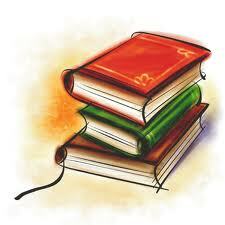 Ball was a local minister, teacher, historian and author. 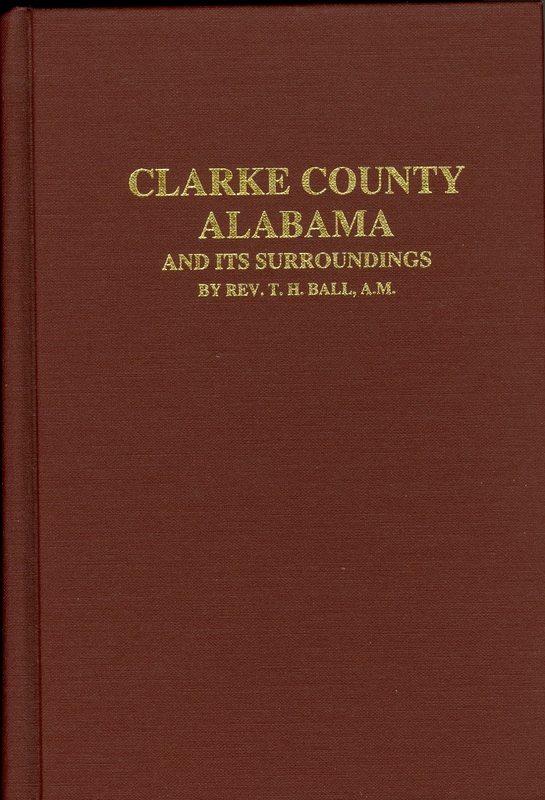 Credited with recording Clarke County’s early history. His book is available in the Museum Book Store. South of Jackson on Co. Rd. 15 (Rockville Rd.) at Entrance to the Fred T. Stimpson Wildlife Sanctuary. 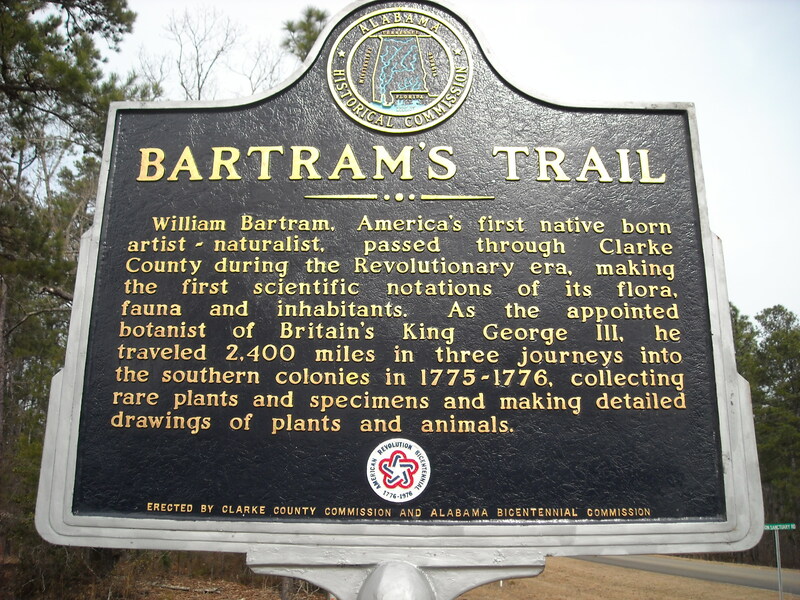 William Bartram was a 1700’s botanist and naturalist who made the first scientific documentations of Clarke County’s early flora and fauna. On Woods Bluff Road (unpaved) off Hwy. 69 in Campbell Community. 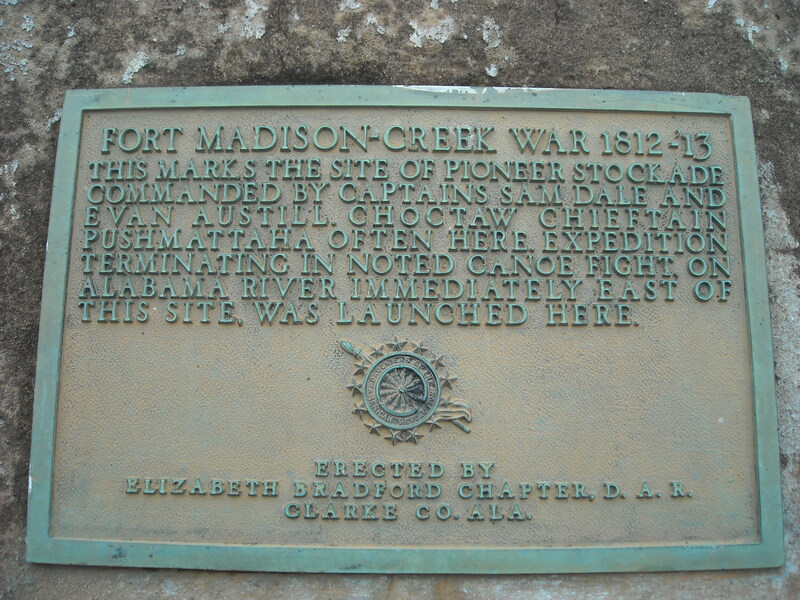 During the Creek War, Col. William McGrew, along with 25 men, left Ft. St. Stephens looking for Creek Indians. Near Woods Bluff, they were ambushed. Col. McGrew was killed as were three others -- Edmund Miles and twins Jesse & David Griffin. All were buried with military honors except David whose body was never found. 400 Commerce Street, Downtown on the lawn of Jackson City Hall. This cannon came from Oven Bluff, site of the Civil War-era Fort Stonewall and also the site of Confederate gun-boat production. 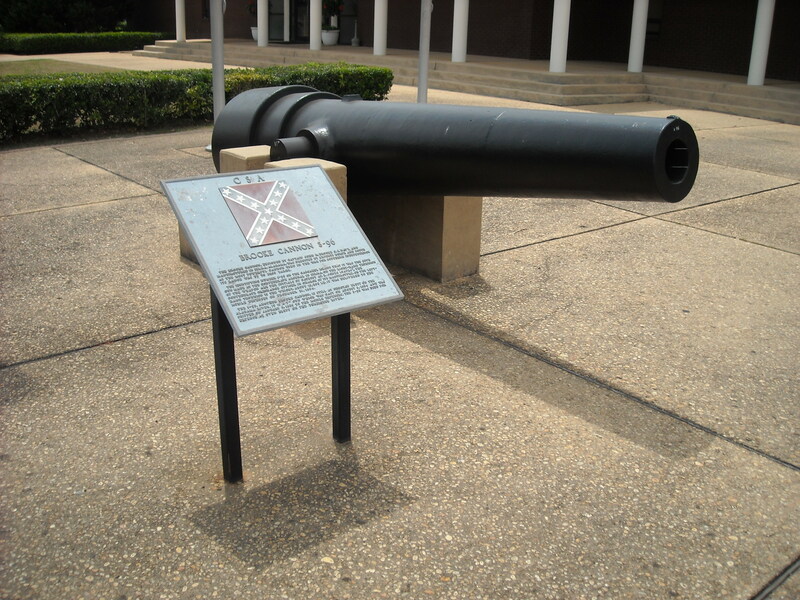 Manufactured in Selma, the cannon was the most powerful type used in the War. Take Co. Rd. 29 to Gainestown. Turn at Overstreet’s Store onto Co. Rd. 35. Marker is approximately a mile on the right. 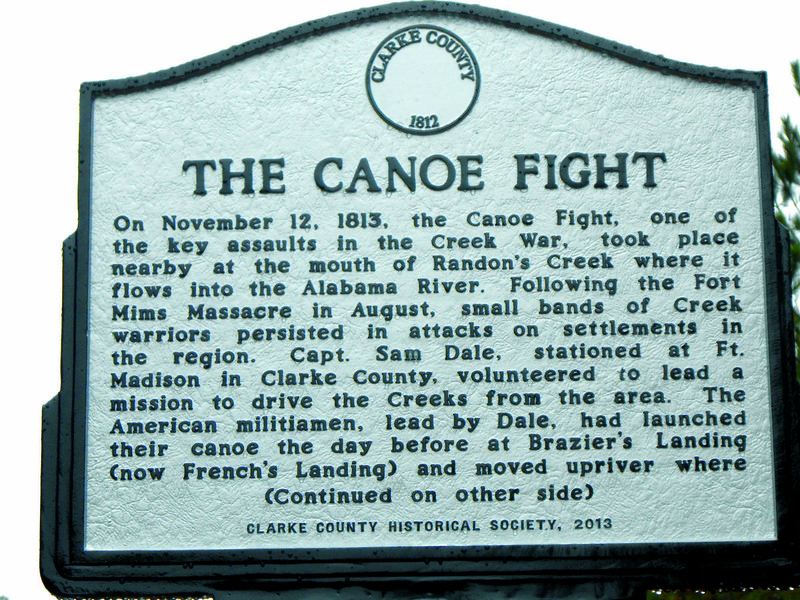 The legendary confrontation that became known as the "Canoe Fight" took place on November 12, 1813, on the Alabama River during the Creek War of 1813-1814. The skirmish gained fame for the novelty of having taken place in canoes, pitting a small band of militia, led by Capt.Sam Dale, against a larger group of Red Stick Creeks . 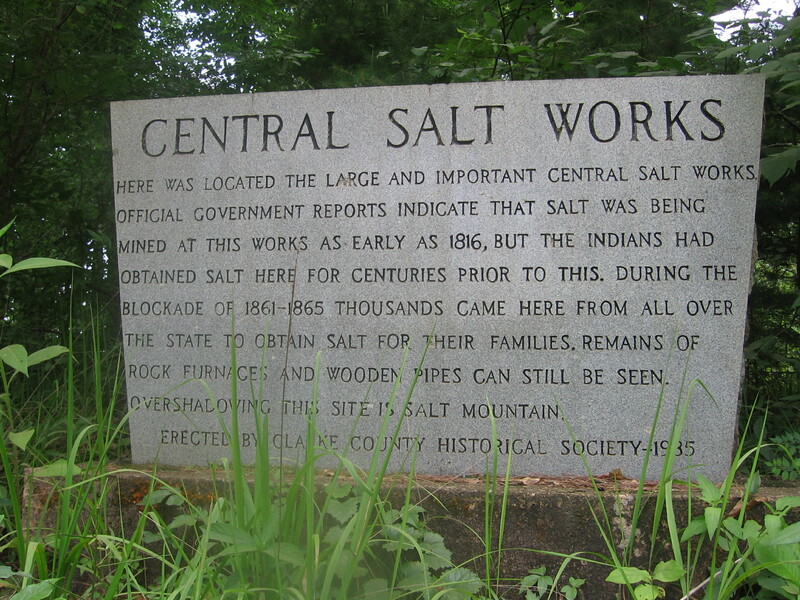 Site of the Confederate Salt Works. Salt water flows out of natural salt springs here, and during the Civil War, it provided much of Alabama’s salt, essential in preserving meat. A ballgame was played here in 1805 between Creek & Choctaw Indians to settle a land dispute. 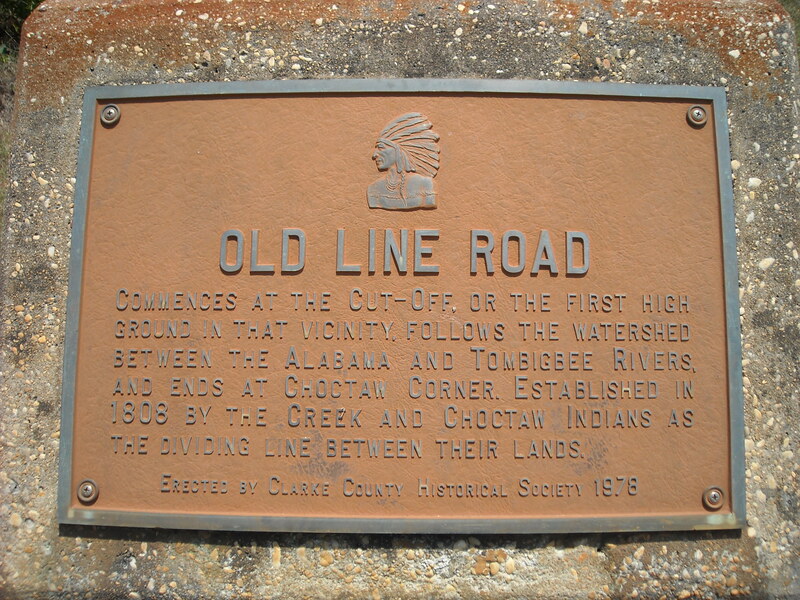 The Choctaws won, selling the land to the U.S. Government & opening the area for settlement & a road. 114 Court Street, Grove Hill. 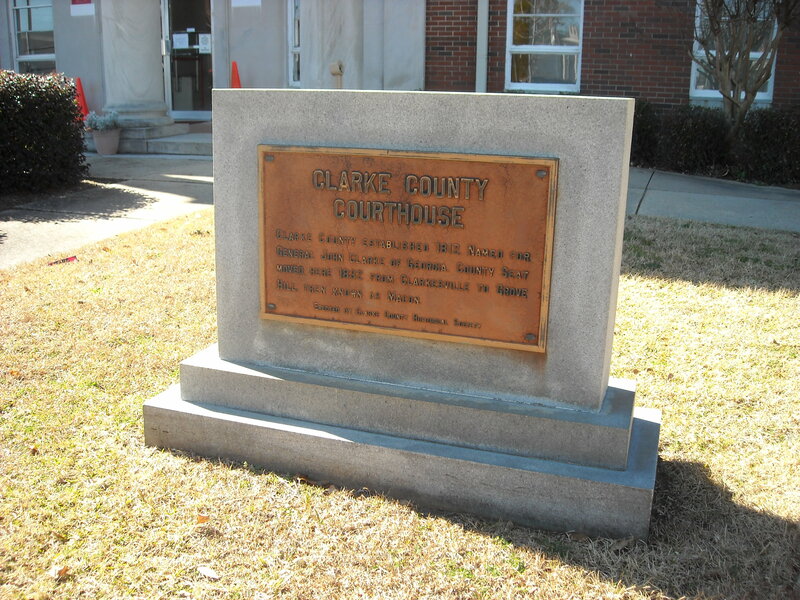 Clarke County was established on December 10, 1812 in the Mississippi Territory. It was named for General John Clarke of Georgia. 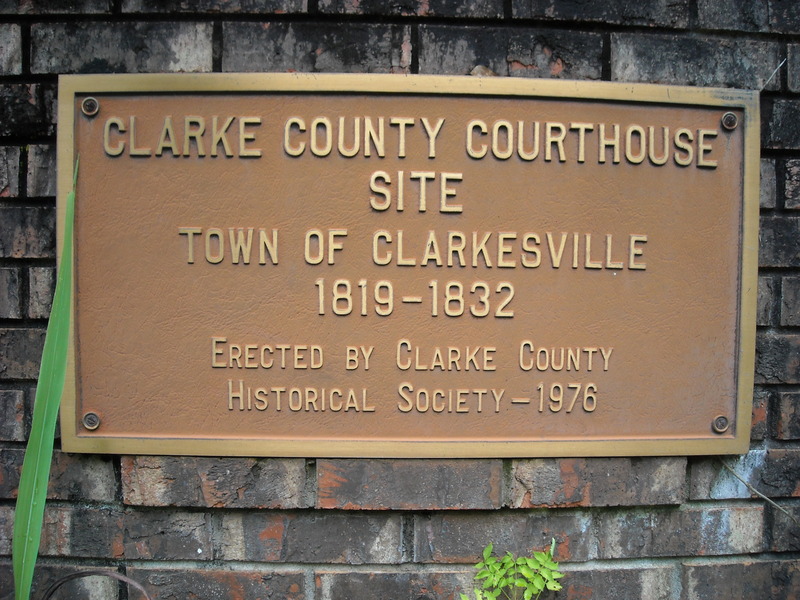 The first county seat was Clarkesville, and was moved to Macon (now Grove Hill) in 1831. 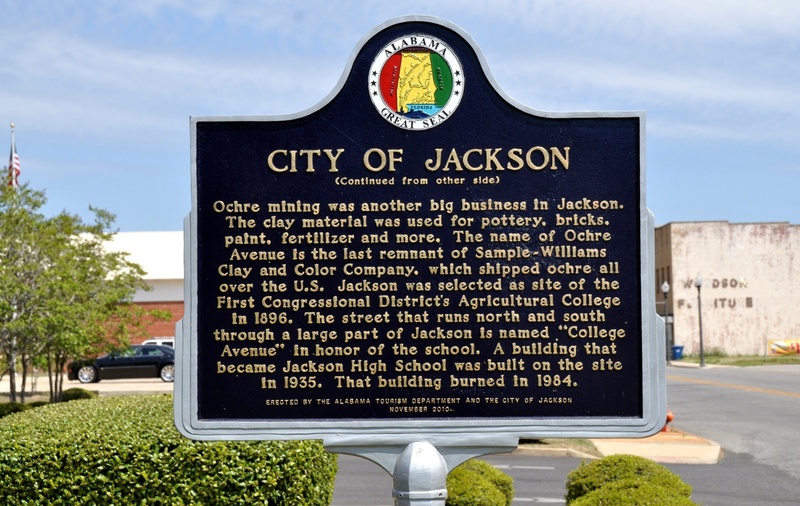 On the premises of Jackson City Hall, 400 Commerce Street. 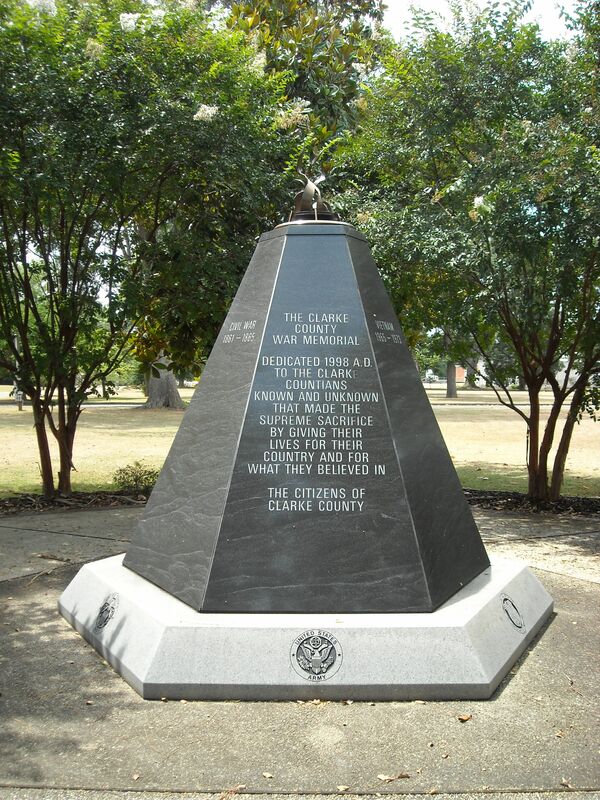 This memorial honors the soldiers from Clarke County who died serving their country. On Clarke County Museum Complex in Grove Hill. 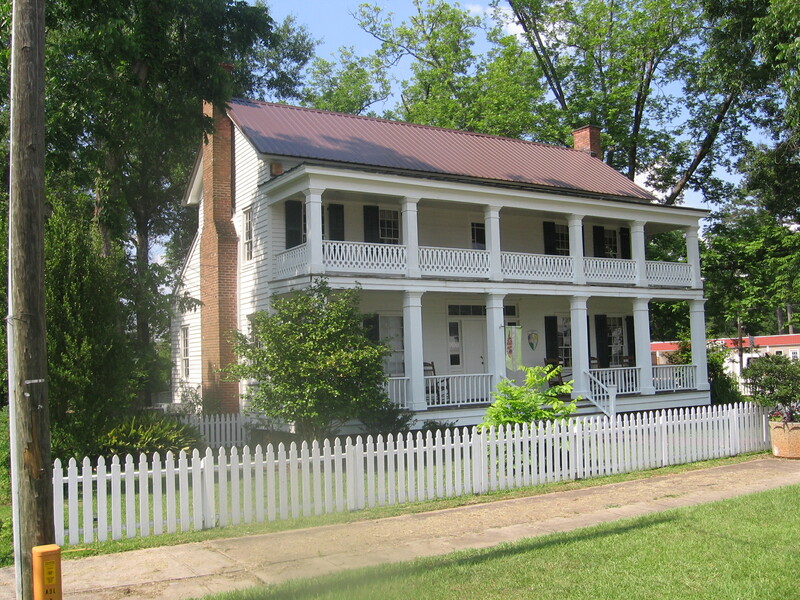 Built in the 1830s, it is one of the oldest buildings of its type in Alabama. 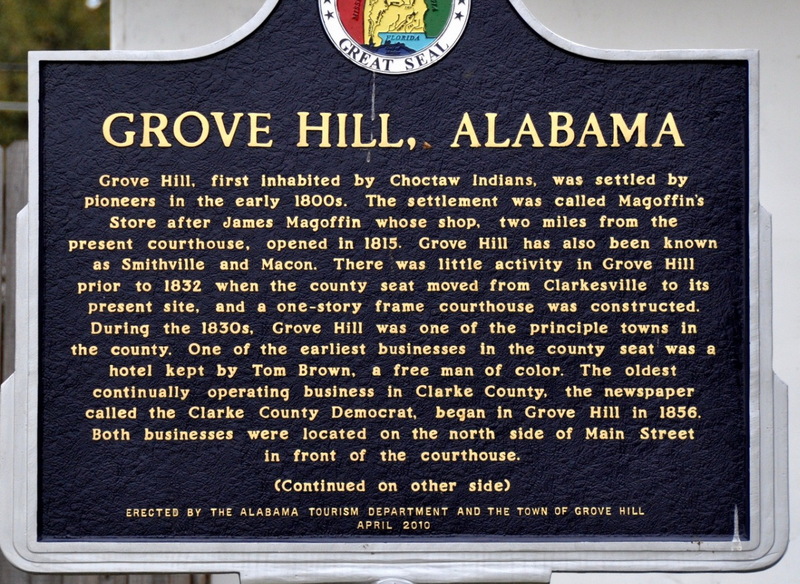 It was the office of Judge John Gates Creagh and now houses the Grove Hill Chamber of Commerce. It is open to the public. Fort Sinquefield is the site of an attack on settlers by Creek warriors during the Creek War. Made famous by Isaac Hayden who saved many settlers by leading a charge outside the fort with a pack of barking dogs. On the National Register of Historic Places. Take Co. Rd. 29 to Gainestown. Turn left at Overstreet’s Grocery onto Co.Rd 35. When the pavement ends, turn left. Marker will be approx. 600 yards on left. First church of record in Clarke County. 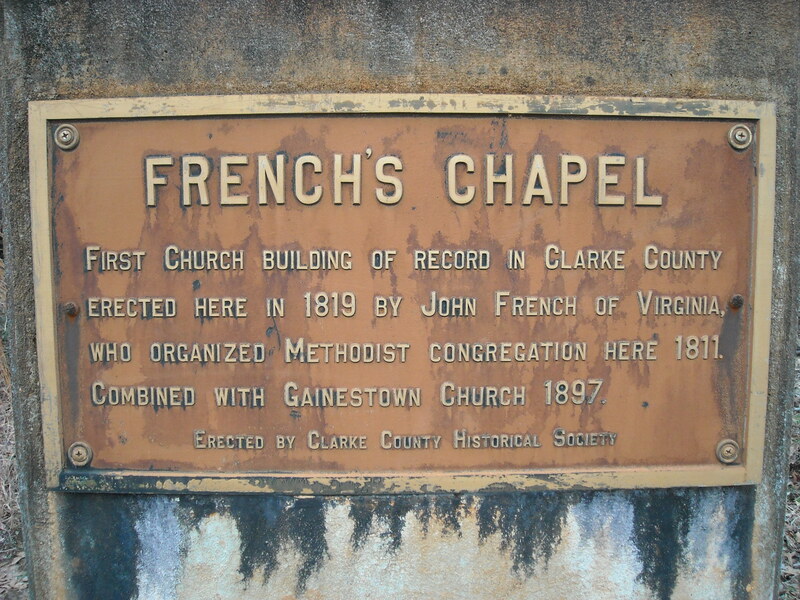 Erected by John French of Va. who organized a congregation in 1811. Co. Rd. 29 in Gainestown across from Overstreet’s Grocery. 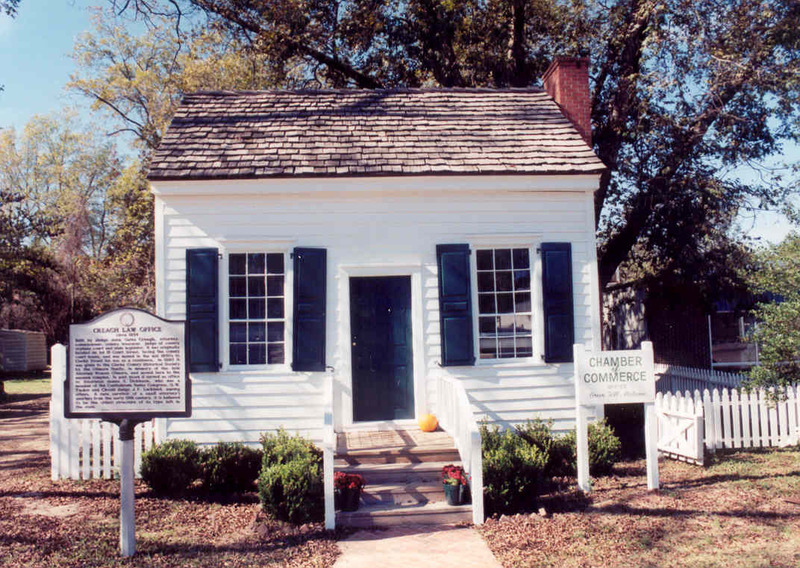 Founded in 1809 by George Strother Gaines as a Choctaw-Creek trading post. 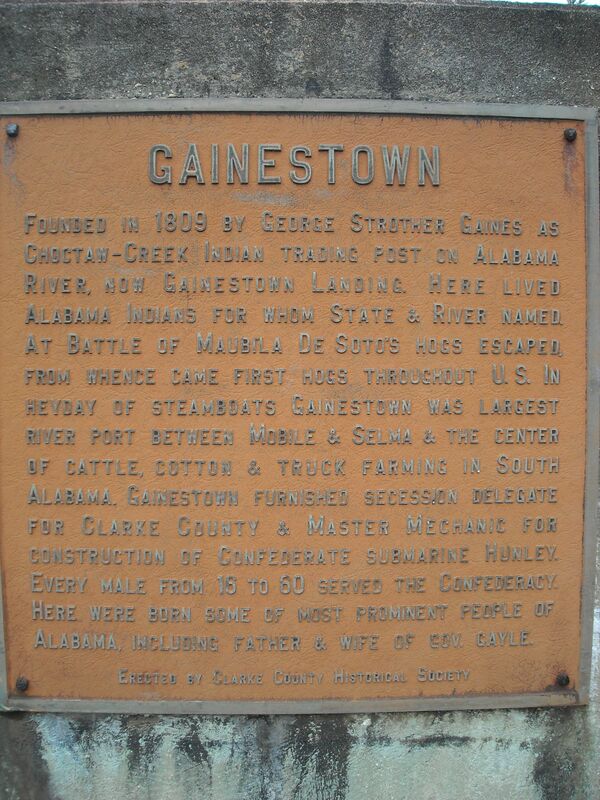 In the steamboat heydey, Gainestown was the largest river port between Mobile & Selma. 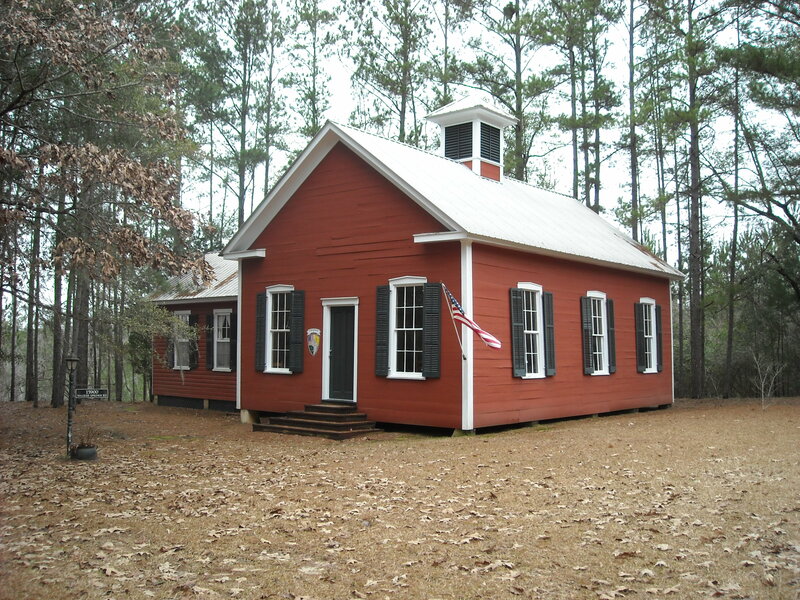 The Gainestown Schoolhouse was built in 1919 as a one-room schoolhouse. The school was expanded to a two-room building in 1930. It is privately owned. Founded in 1819 by Rev. Joshua Wilson, The church was built in 1854 and was two-story, with the church on the lower floor and Masonic lodge on the upper. The building was damaged by a tornado in 1911. It was rebuilt immediately as a single story building using much of the material from the original building. 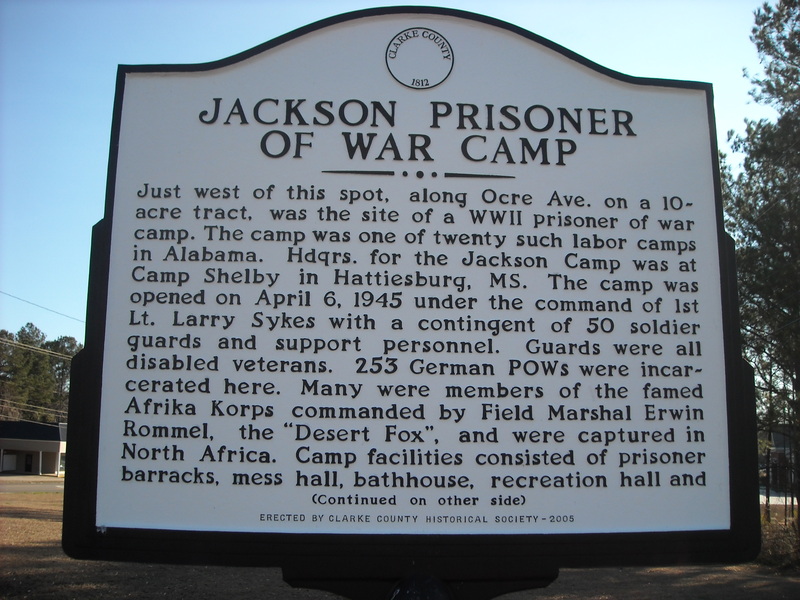 Jackson was home to a small Prisoner of War Camp during World War II. It housed Germans who were part of the Africa Corps. Inside Laurie Carleton park across from the Clarke County Courthouse. 400 Commerce St. at Jackson City Hall. 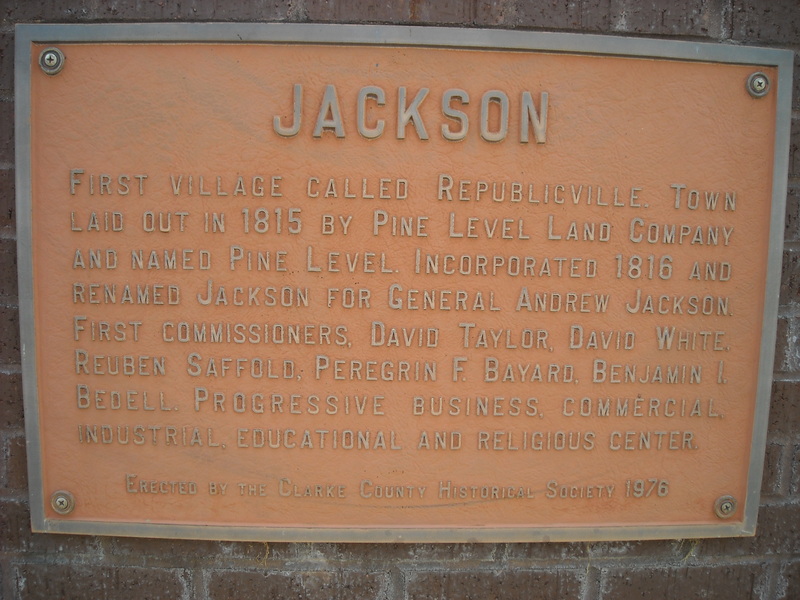 Jackson was laid out in 1815 by the Pine Level Land Co. and named Pine Level Land Co. It was incorporated in 1816 and renamed for General Andrew Jackson. 400 Commerce Street, Downtown Jackson at the Jackson City Hall. Jackson was laid out in 1815 by the Pine Level Land Co. and named Pine Level It incorporated in 1816 and was renamed for General Andrew Jackson. General Andrew Jackson, later president, camped in 1813, along with his troops, near this spot. 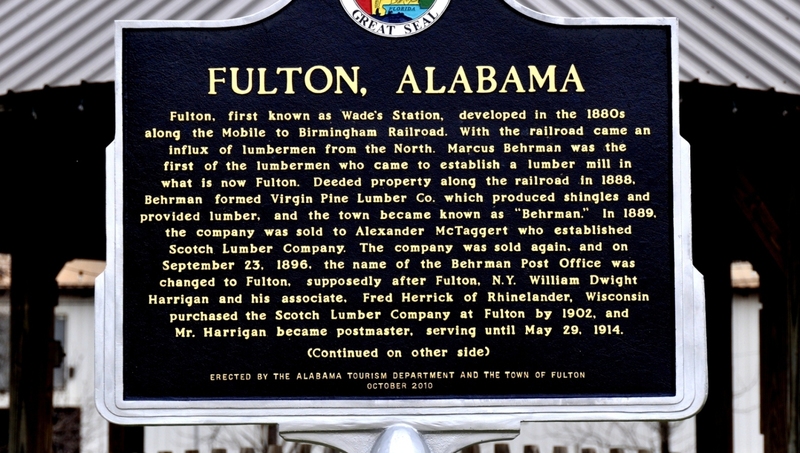 He was quite popular in the county, and the city of Jackson is named for him. 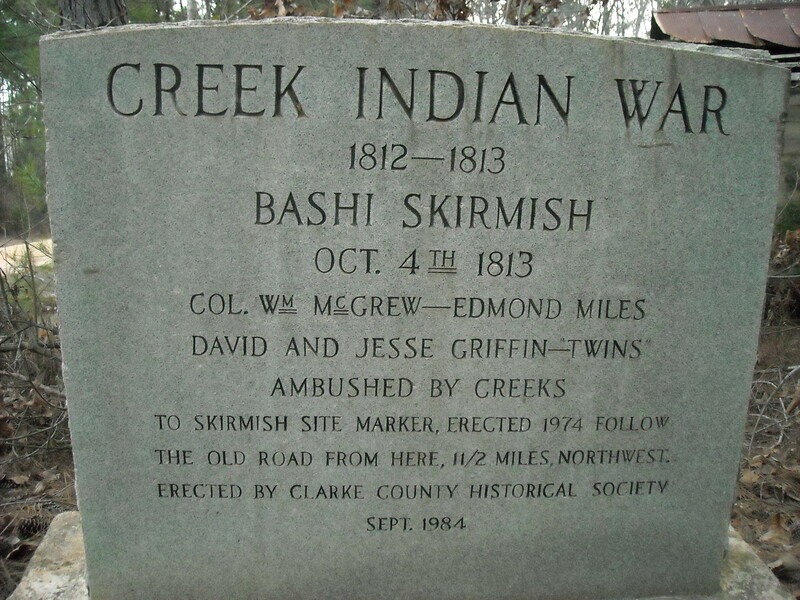 Isham Kimbell (1797-1881) was the only family member to survive the Kimbell-James Massacre near Ft. Sinquefield, during Creek War in 1813. Elected County Sheriff and in 1833 Clerk of Circuit Court, serving several terms. Successful merchant until his death in 1881. Married Martha T. Carney of Carney's Bluff. Both buried at Pine Crest Cemetery, Jackson. Built in 1848 on Lower Commerce Street. 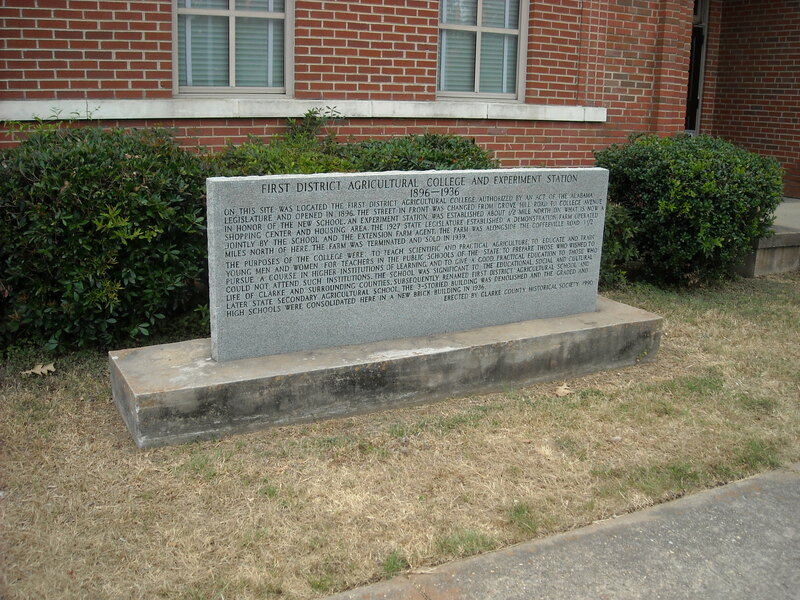 Given to city by Woodson family and moved to this site in 1977. Open by appointment. U.S. Hwy. 84 West of Whatley. 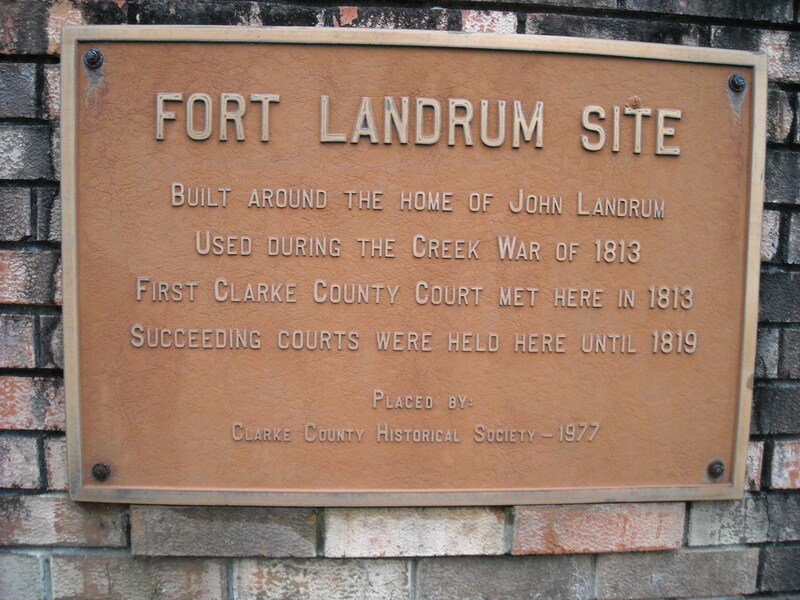 Took place September 1, 1813. During the Creek War a Red Stick leader, Prophet Francis, led Indians in the raid on the Kimbell home. They killed and scalped 12 of 14 (two survivors left for dead); pillaged house, and killed livestock. For more info, click here. One of the best known educational institutions in the county. 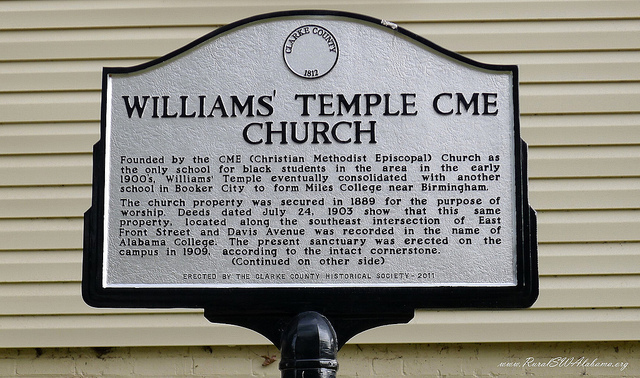 Built in 1880, it was named for Alabamian William Rufus King who was elected U.S. Vice President. 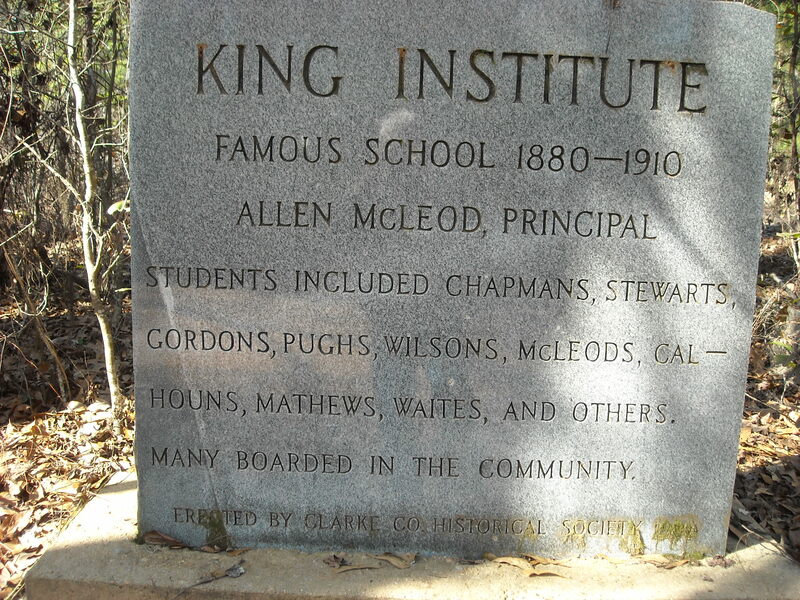 Prof. Allen McLeod was teacher, and pupils were largely made up of children of the county’s first settlers. This 1900 structure is located in the Historic District. It is one of Jackson's most outstanding examples of Queen Anne style architecture and is listed in the National Register of Historic places. 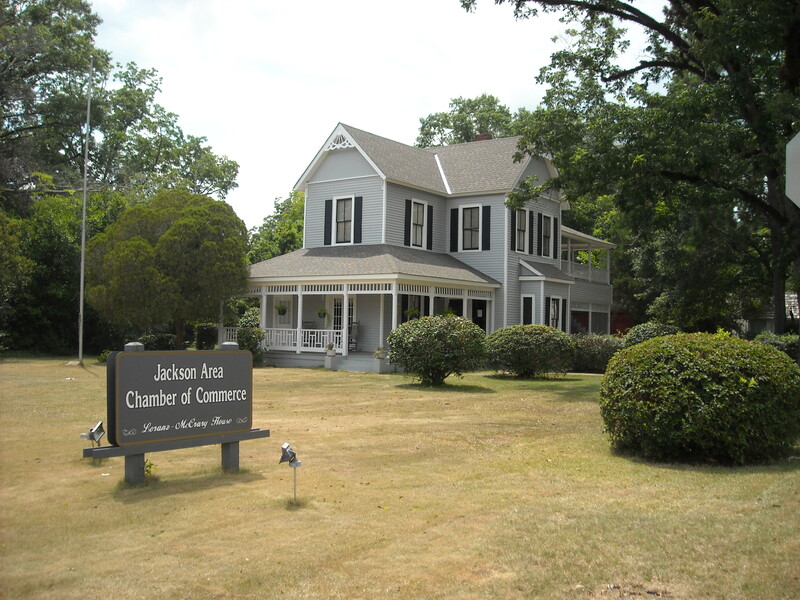 Now home to the Jackson Area Chamber of Commerce. Open to the public. Early 1800s cabin typical of early Clarke County settler dwellings. Moved and restored in 2006. Open to the public. Highway 154 in the New Prospect Community. On U.S. Hwy. 84 East in the Gosport Community. 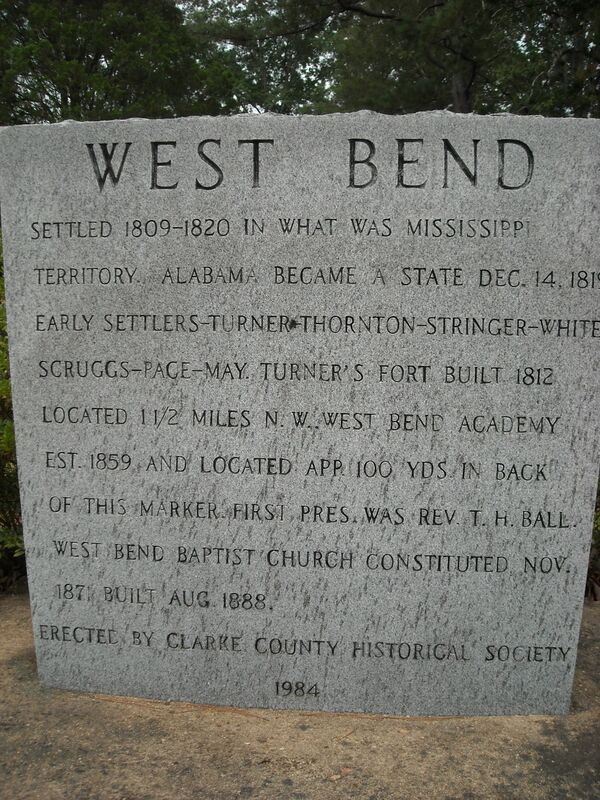 Alabama’s 4th governor is buried near this site. He was governor from 1825-1829 and was elected to one term in Congress in 1833. He died in 1841. This ghost town was county seat from 1819 until 1831. 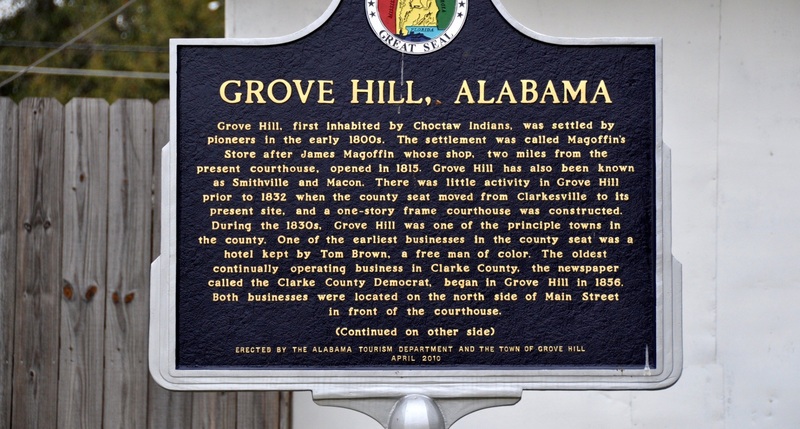 Legend states that the town wells ran dry, forcing the county seat to be moved from Clarkesville to Macon (now Grove Hill). William Barrett Travis, who lived in the neighboring county, is among those who practiced law there. Now Co. Rd. 35, this road follows the watershed between the Alabama & Tombigbee rivers. 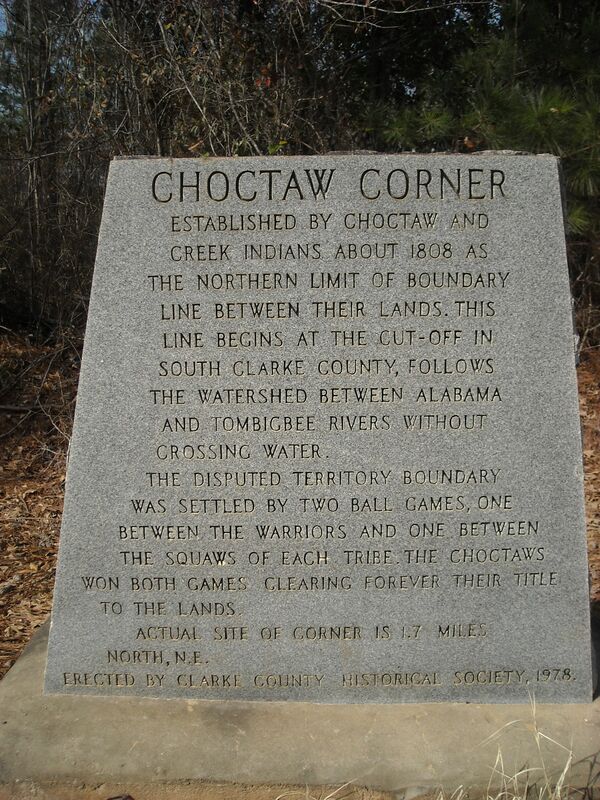 It was first surveyed in 1808 and was the de-facto dividing line between the Creek & Choctaw Native American tribes. Off Highway 69 between Jackson and Coffeeville. 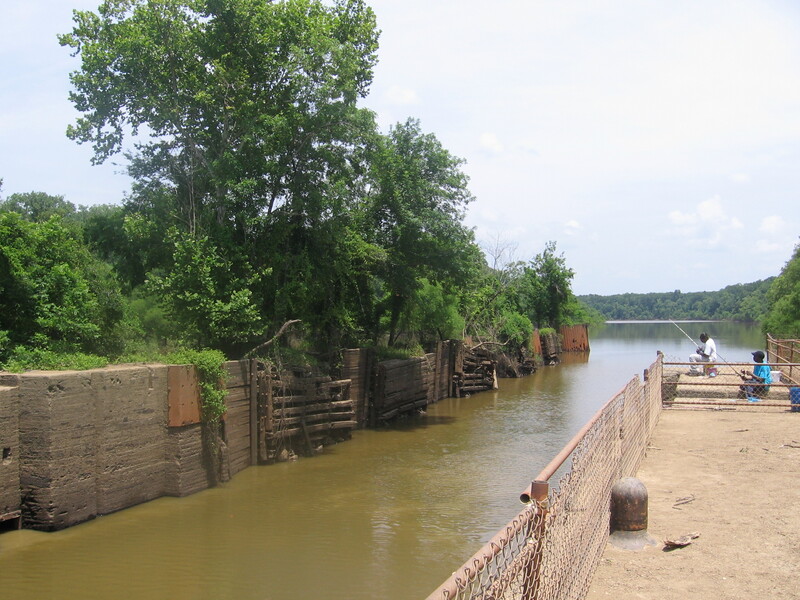 Authorized by Congress in the 1880s, old Lock One was part of a series of locks on the Tombigbee River. In use until the 1950s, when the Coffeeville Lock & Dam was built. Today, the lock is in an ox-bowlake, with surrounding land open as a park.. It is the only one of the remaining locks of its time still visible above the water line. Owned by U.S. Army Corps of Engineers. Open to the public. On Hwy. 84 W, just west of MM 40 on Crescent Rd. 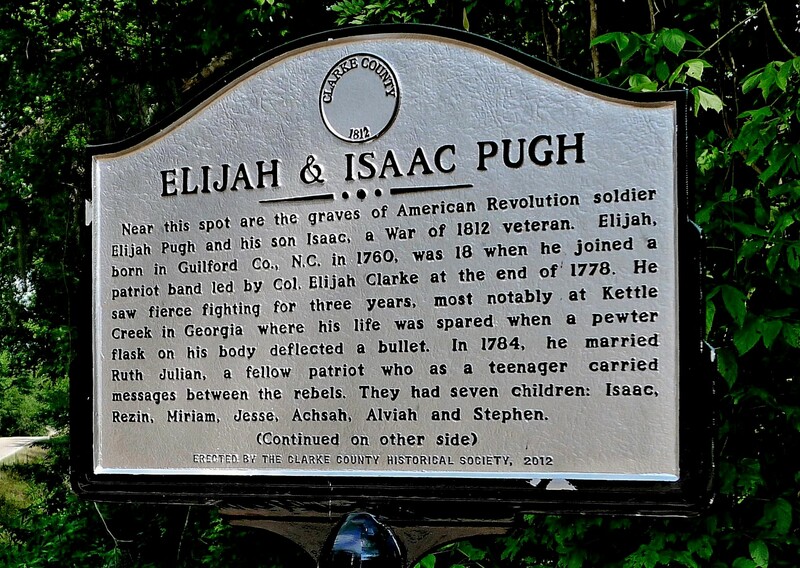 Near the burial sites of Revolutionary War soldier Elijah Pugh and his son, Isaac, who fought in the War of 1812 and was a friend to Chief Pushmataha. 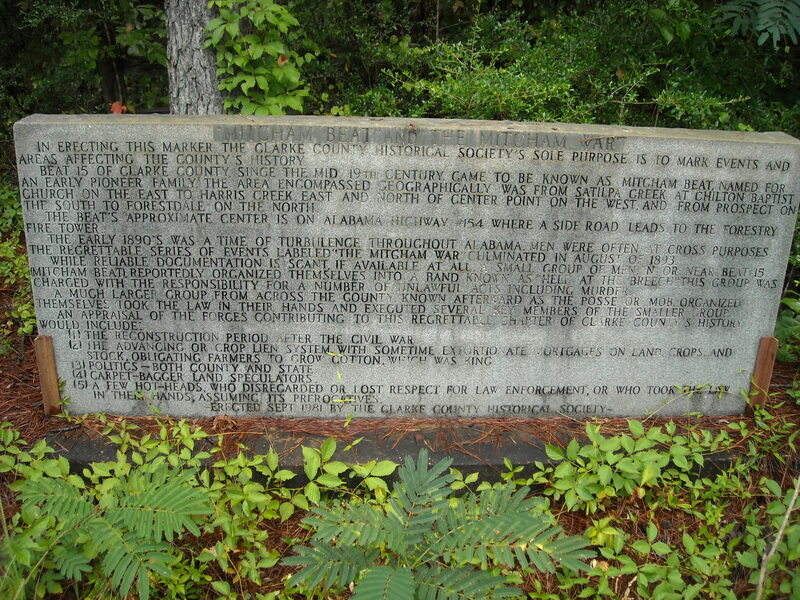 Monument to the men from Clarke County who fought in the American Revolution. On Main Street in front of the Clarke County Courthouse in Grove Hill. 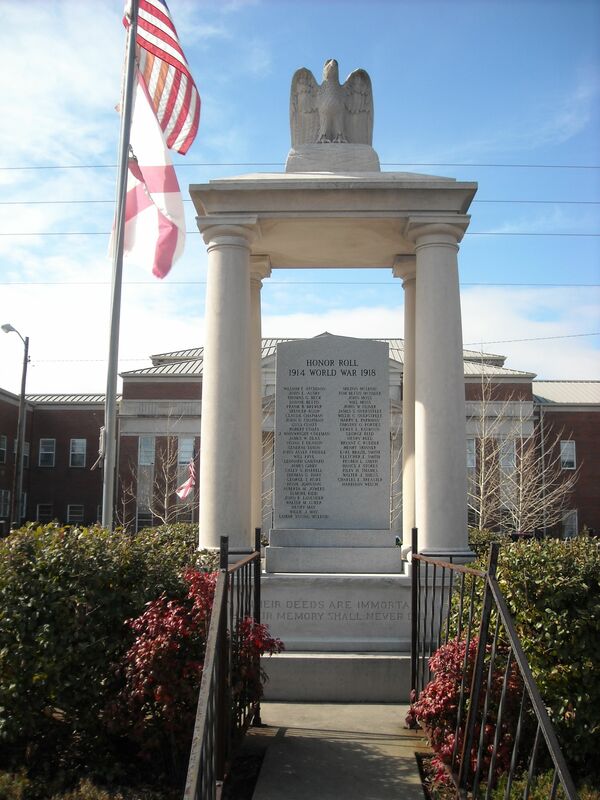 Erected to honor those soldiers from Clarke County who died in World War I. The original markers segregated the names of the black and white soldiers. 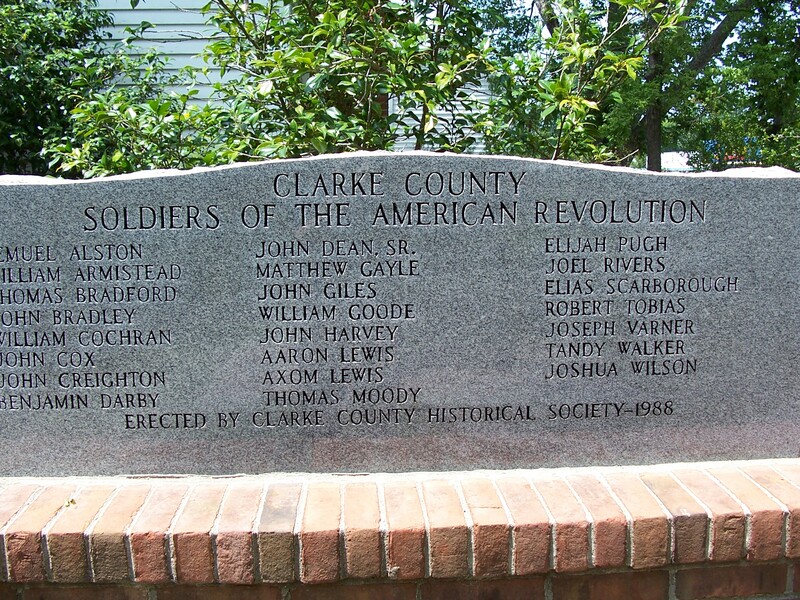 That marker was moved to the Clarke County Museum in the 1990s, and a new marker, with all the names of the soldiers on the same side, was installed in the old marker’s place. Co. Rd. 35 headed East. 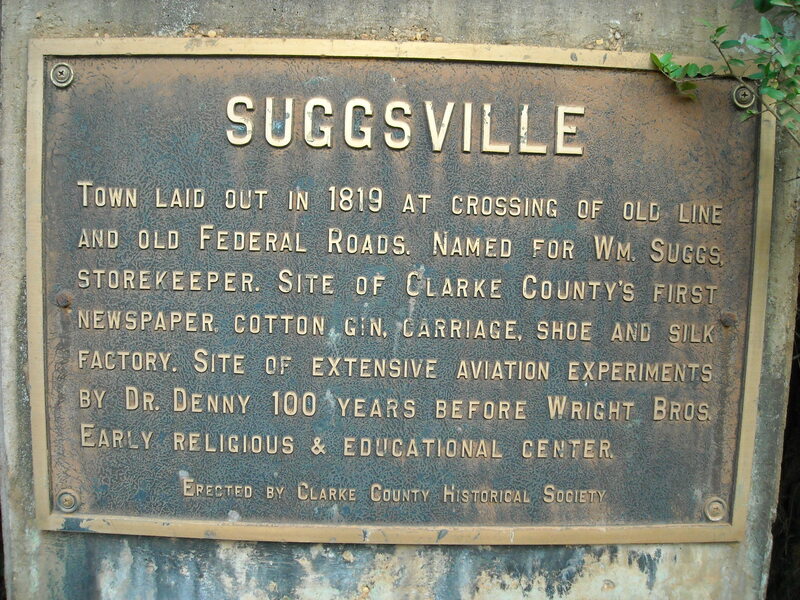 Laid out in 1819 at the crossing of the Old Line & Federal Roads; it was named for storekeeper William Suggs. Site of county’s first newspaper. Aviation experiments were carried out here by Dr. Denny prior to the Wright brothers. 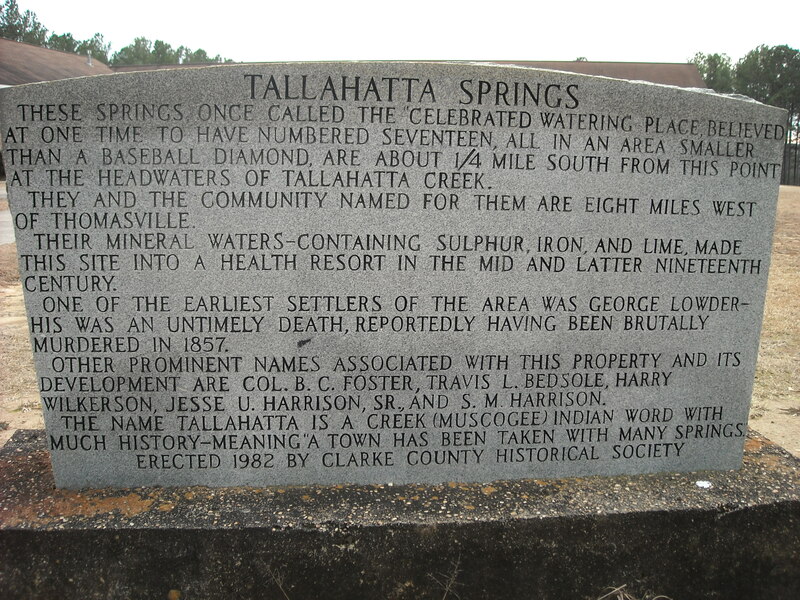 The site of a mineral spring, Tallahatta Springs once boasted a health resort in the mid-19th Century. This early corn crib is believed to have been constructed out of wood from Fort Turner, an 1813 Creek War fortification. Moved and restored in 2002. Open to the public. Intersection of Ala. Hwy. 69 and Co. Rd. 154 north of Coffeeville. 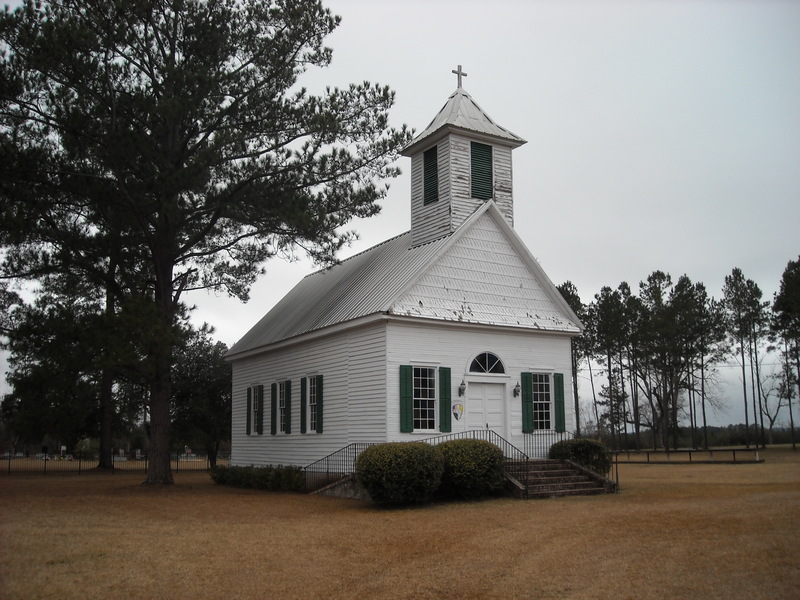 Oldest continuous church in Clarke County. It was organized in 1816. 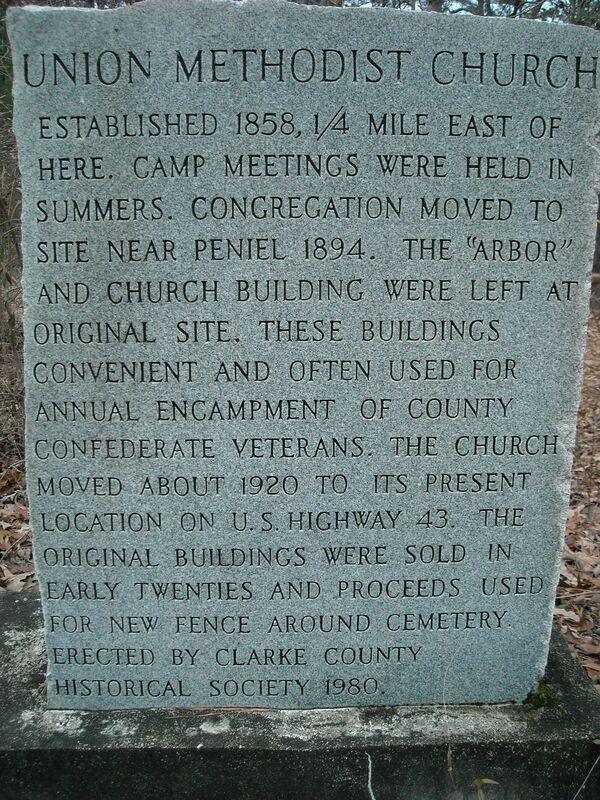 Old Union Church was an early church in Clarke County that was most famous for hosting Confederate veteran reunions. Highway 69 between Jackson & Salitpa. 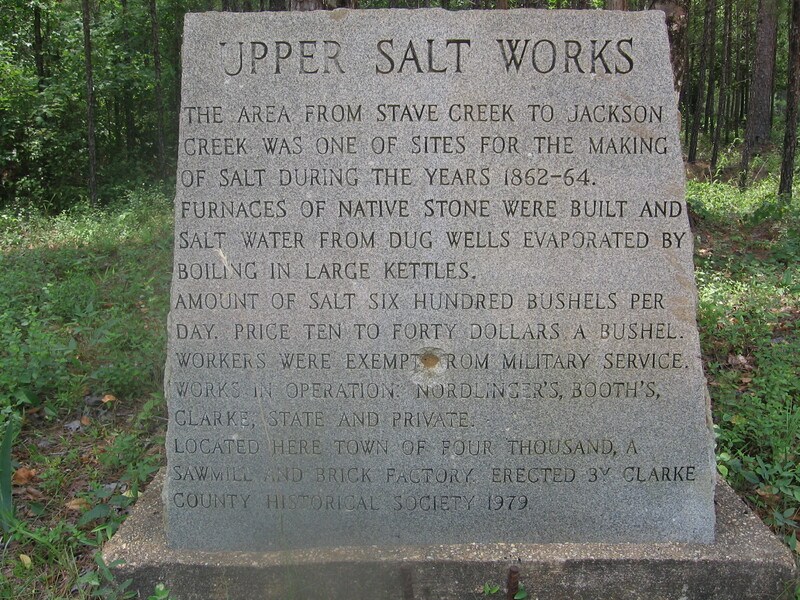 Site of the Confederate Salt Works. Salt water flows out of natural salt springs here, and during the Civil War, it provided much of Alabama’s salt, essential in preserving meat. 600 bushels of salt was produced each day. A big town grew up around the area, but disappeared after the end of the War. Co. Rd. 21 in West Bend. Community was settled in 1809 in what was then the Mississppi Territory. 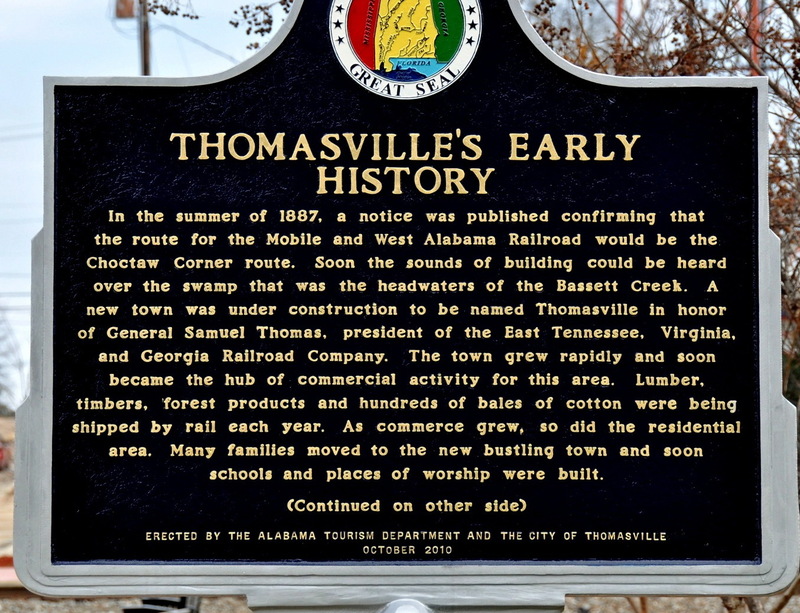 Named for its location along the Tombigbee River. Co. Rd. 29 in Gainestown. 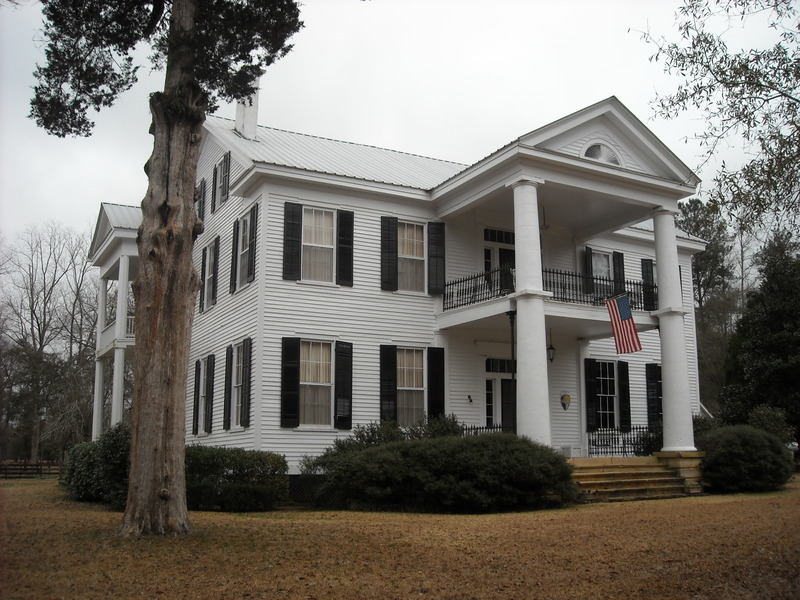 The Wilson-Finlay House was built between 1846 and 1851 for Dr. Joshua Sanford Wilson who was a planter, physician and politician. Built by Isaac Fuller from Maine, stonemasons were brought from England to build the foundations and limestone columns. On the National Register of Historic Places. It is a private residence.